Once more the time is upon the Israeli political and military leadership to figure the most beneficial path forward and what role they wish for the presumed eternal friendship and joining at the hip of the United States and Israel. At the top of the discussion is that connection at the hip which is a three-billion dollar military aid package which needs reviewing. Rumored in the deal presented by President Obama is the demand that the twenty-six percent of those funds permitted to be used by Israel domestically be phased out and that all aid be approved by the President before being shipped even during times of duress such as in a conflict with Hamas, Hezballah or other entity, not exactly an unusual enough occurrence. The difficulty this could present was driven home when President Obama using the State Department held up the scheduled resupply of Hellfire missiles during the 2014 Hamas conflict forcing a rethinking of plans to operate without that strategically vital and important weapons system. Many are looking at the plan and seeing it as a poison pill which Israel should refuse to swallow while others point to the fact that Israel, until President Obama, had almost never had any difficulties and they claim that the American people or Congress could mediate any difficulties despite the wording of the new arms aid proposal that Congress must have no recourse, council or affect upon any decision made by the President and their administration in such military matters concerning Israel. This places an irreversible veto to all military aid in the hands of a single person, the President of the United States, and contrary to seeming popular memory, this was not the first time that an American administration attempted to change the course of a war when the Nixon administration under the advice of Secretary of State Kissinger delayed resupply to Israel during the Yom Kippur War where it was rumored that the missile silos were opened to persuade the Americans that Israel desperately needed the weapons to avoid an escalation neither side desired. That is rumored to have been a very persuasive argument and the arms were released. That led to some of the arms set aside for Israel to be stored in Israel such that Israel never face that predicament again, but obviously that arms cache cannot hold every type and number which may become required or there would be no need for negotiations on a new deal. There is a second side to the deal which has developed some serious problems and newly found difficulties, the F35 JSF aircraft. The persisting software problems which are delaying delivery to United States frontline air units, the overheating of an aircraft whose electronics are currently cooled by opening all the weapons bays for one minute every ten to fifteen minutes as necessary which compromises every stealth design of the airframe giving enemy radars a fully obvious aircraft for prolonged times otherwise the electronics start to fail, other stealth problems which were unanticipated in the computer modeling (there is something to say for clay and full-scale modeling and test chambers over computer theories), and the necessity to download all information after each flight, the uploading via military network of flight plans before each mission, the ability of the United States to ground all F35 JSF including those given Israel or just the Israeli aircraft, the ability to take charge of the plane mid mission under certain limitations and a plethora of problems some of which will likely not be known until it is too late which makes this aircraft too reliant on American assistance and goodwill to use as the primary fighter in the IAF. Some of these shortcomings have been covered by Caroline Glick and others in their recent articles as well. Apart from our hopes that the delays and other difficulties cause Israel to never take delivery beyond their initial flight of F35 JSF fighters, the truth is this aircraft fails all standards of measure due to the facts that the aircraft is undeployable as configured, lacks independent missioning of the aircraft free of United States approval, impossible strictly dependent repair as the only method for troubleshooting of the system software and other electronics is by using diagnostics kept within computers in the United States via “secure” downloads and upload of repairs and updates (think Obamacare software or early versions of Windows), and a host of other problems of accepting and basing your nation’s air capabilities on an aircraft not ready for prime time or even airshows without numerous upgrades and some probable system rebuilds which would require returning the fleet to the United States in too many situations. 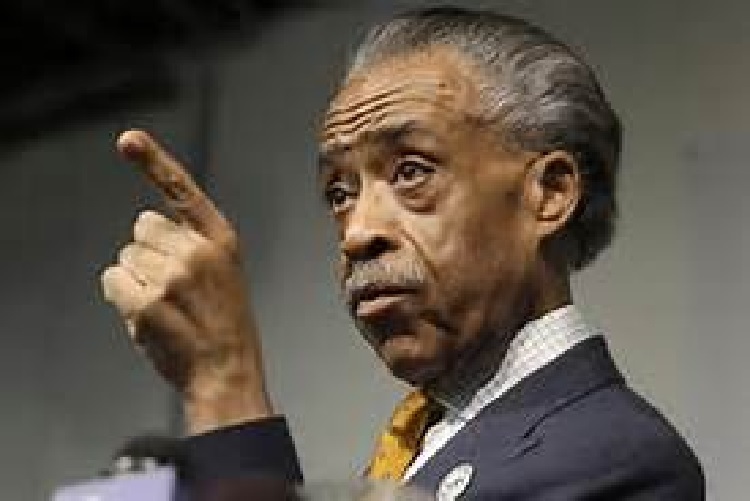 Then there are the negotiations for a new defense treaty which holds a number of points which are equally, some even more so, troubling with the cancellation of the funds available for Israel use at home being just an average of the problems being demanded by the Obama White House. Some even work to the detriment of the United States as well, but even that sacrifice is nothing when one is working to cripple Israeli future defense capabilities independent from White House whims of the moment. Dropping the Israelis ability to use around quarter of the funding on Israeli military spending which will slow both nation’s research in vital areas as the Americans, due to the assistance received from Israeli research in areas such as drones and anti-missile research and development, are dependent on Israeli research to direct their developments in these areas. But this is all about forcing Israeli military research and ability to be strangled making them further dependent upon the United States for any and all advanced weapons systems and greater dependence upon American weapons systems thus placing Israeli defense under control from the White House and, unfortunately, also the State Department. So, if this is looking like such a stifling deal for the Israelis, then why is there even the slightest consideration given this deal instead of just walking away until the deal returns to something more beneficial for Israel or otherwise prepares to go their own way. The reason for the United States to like this deal are obvious as they would receive all the aid money remaining in the United States spent to strengthen their military and related industries. Further, any surviving Israel research and development would mostly be reliant on United States direct funding, control and benefit from all advances while Israel would be denied similar developments from integration of such discoveries as they will likely no longer be a part of the development team. With time the Israeli defense industries will suffer atrophied funding with many eventually being absorbed by their American counterparts. This in and of itself should make the entire deal a nonstarter. Still, the Israelis are attempting to find the right lipstick which they can put on this pig and make it presentable to the Knesset, the Israel Defense Force (IDF) and the Israeli public. Still, the political class and some in higher IDF circles are actually going through makeup kits seeking to find the exact shade of lipstick as to sell this deal claiming waiting until the new President is sworn in and then reach a better deal as there are no guarantees on who the new President will turn out to be or their actual feelings regarding Israel. They claim that despite the obvious problems, this treaty can be worked under and improved with time which should allay any Israeli fears. They try to sell this agreement using fear melded with claims that the deal is not as bad as being reported. The real reason that so many top military personnel and politicians are so willing to take this deal is their fear of not possessing the F35 JSF, the aircraft for the next fifty years for the Israeli Air Force. They claim there should be no worries over any early on difficulties as fixes will be forthcoming. We are less optimistic and believe the F35 will be full of difficulties finally seeing limited use in the United States. The deal’s future demands it be completely accepted as is and cannot be altered by Israel, Congress or even a future President. With these clauses the entire deal becomes a poison pill. The reason any deal has these supporters within the government and the military, especially fairly high up, is these people seek an external source upon which any refusal of action or other distasteful or unacceptable decision could now be passed along and blamed on matters at levels the people are unaware of and pressing interests of an essential ally were involved in the decision. So any deal is a reusable ‘get out of the dog house’ card with which all unpopularity is due to agreements and pressures and such are beyond their control and the people will need to just understand and the media will drop the issue as the fix is in. Yes, obviously there may be such pressures, but that is simply another reason not to accept any deal, contract or treaty in which Israel surrenders her free ability to act to another nations or, as in this case, any foreign individual thus compromising Israel’s ability to act when Israel deems the necessity and not when it is convenient for some foreign head of state whose people are not generally hurt or otherwise compromised by Israeli inaction. Israelis have seen sufficient friends, relatives and even family die after checkpoints were removed to satisfy an unsatisfiable, unfeeling foreign leader whose only problem is Israel and her defense or loss of lives is not their number one problem, the fact Israel exists has become that problem. Such power must not be surrendered unto any foreign decider, especially a position whose track record has been, when it came to Israel and the peace process, to demand from Israel every surrender, sacrifice, concession and other acts of denial or risks taken while ignoring even the broken agreements, treaties and promises from Israel’s enemies simply because, as Israelis too often hear, we are the civil partner of the United States and as such more is demanded from Israel. Perhaps the Israelis would be best served by refusing any deal and manufacturing and designing Israeli first equipment as this would bring building all Israeli defense and military capability home and employ Israeli engineers and manufacturers within our borders and then if the Israeli government were to buy American armaments we can do so as an equal nation and not one dependent on the good will of any foreign power. The Israeli economic benefit from producing our own defense equipment and servicing Israeli designed, built, and software developed domestically would offset any loss of foreign funds. Such systems desired from the United States or any other provider would now be made as an equal and not as the beggar using daddy’s money with limitations which must be accepted as a beggar depends on the alms giver. As an equal, Israel will not be dependent on any foreign power for upgrades and installation of codes or flight permissions even to fly training exercises as now exists. One need wonder why only Israel is kept on such a short leash while other receptors remain independent and do not need sign away sovereignty just for a few pieces of copper. Perhaps Israel needs not the alms which indebts Israel to any foreign influence leaving Israel compromised. Perhaps Israel need rely more on Israel. We could file this one under the it’s about time file, but perhaps we should wait and see what develops. We have heard of a new aircraft to replace the aging B-52 fleet which has been around almost as long as Donald Trump. John McCain announced Thursday he would block the Air Forces using the often used method of cost plus type of contract on the proposed plan as it would leave the government responsible for cost overruns with no incentive for Northrop Grumman to work to avoid such costs. The engineering and development phase of the program is valued at $21.4 billion according to the Air Force and is conditioned on a cost plus contract with incentive fees for coming in on budget. Such cost plus with incentive presumably works that if an incentive is juicy enough the contractor will produce the bid for project on budget in order to receive the incentive which would presumably be pure profit as no additional work is required within the scheduled time-frame. This, of course, begs a simple question as to whether the company is really doing any additional work to bring any project in under budget and gain the incentive is really more profitable for the company than having cost overruns and extensions on the delivery dates or whether running a project over budget and time is not more profitable as it also keeps employees on a project until the next project perhaps with the Navy or Army can be procured. The game of defense budgets and projects always appears as a nightmare in tricks, gadgets and more costs per-project as time goes by. Sure the aircraft today are far more intricate and sophisticated but so are design and production techniques. When the B-52s, now what one might call a venerable aircraft as it has served well past its intended time in service, were initially built the separate assemblies were built at the same location as the rest of the aircraft and the entire assembly had tolerances which today would be unacceptable but today half the fabrication of parts is performed by robotic units which produce part after part with what would be humanly intolerable accuracy. Robotic welding is common and do not even get started on the exotic materials used in these modern stealthy aircraft. So, without dragging this out, here is the artist’s rendering of the new B-21 bomber. I can hear the reactions now; half of us are all but drooling on our keyboards while the other half are scratching their heads asking themselves, isn’t this just a slightly tweaked Northrop Grumman Corp B-2 Stealth Bomber? Well, of course not. 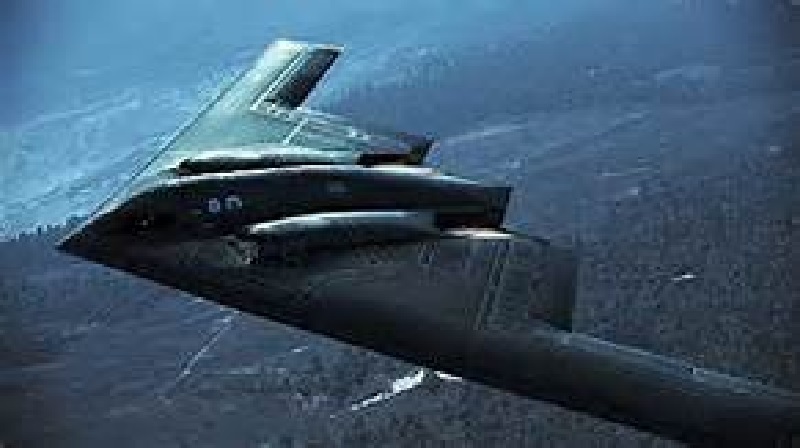 This is an entirely different aircraft and can in no way be thought of as an aircraft utilizing the same airframe as the B-2 as the picture below demonstrates. You can see the obvious differences, the air intake and more of a ‘W’ shaped body and there must be an unbelievably difference inside and in capabilities. Let us go to the source with comments by United States Air Force Secretary Deborah James who stated, “The B-21 will allow the Air Force to operate in tomorrow’s high end threat environment. Our fifth-generation global precision attack platform will give our country a networked sensor-shoot capability that will allow us to hold targets at risk in a way the world – and our adversaries – have never, ever seen.” Then Secretary Deborah James went on and clarified our confusion explaining, “The B-21 looks very similar to the B-2 and will employ existing technology.” Aha, it is made by the same company as who produced the B-2, it looks a lot like a B-2 and the B-21 will use the same technology as we currently have with the B-2 and we really need this new aircraft, a fifth generation aircraft which has so little to do with that old fourth generation B-2 aircraft. All right, I got it now, I think. 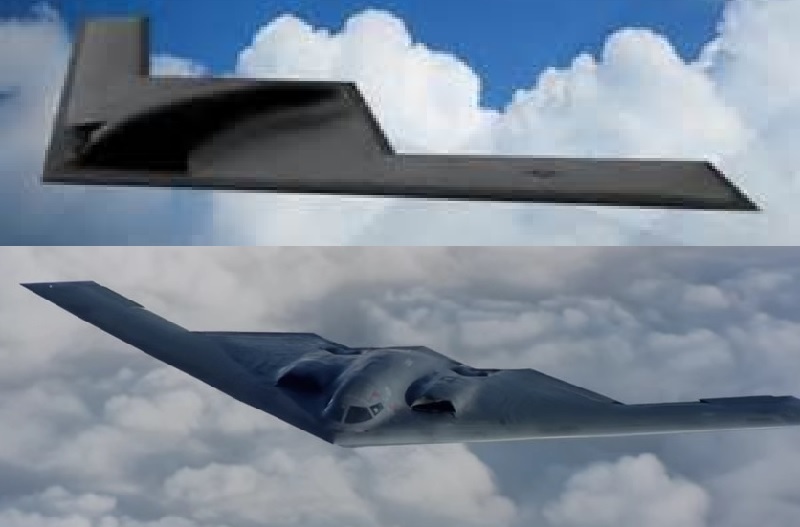 Well, let us for argument’s sake compare them side by side and as all our searches for specifications produced this, ‘Very few specifics are known about the new stealth bomber,’ we are left to our own devices on this one for now. So, about the side by side and we are not going to label them. B-2 vs B-21, What’s the Difference? We really should reserve final judgement on the B-21 until the specifications are made final. As I recall, there were munitions which could not be carried in the weapons bays (bomb bays) of the B-2 and it had to be one of the slowest bombers on the planet which made it completely unsuitable for daytime bombing for which there were fighter/bombers with stealth which could carry out such missions. Of course having a long-range bomber which is unsuitable for daylight raids apparently was not a concern to the Air Force when they contracted for the B-2 which once the B-21 hits production will be obsolete leaving the B-52, sorry, venerable B-52 as the long-range bomber of choice, unless it is a nighttime raid. Perhaps it is just me but I thought the advantage of a long-range bomber was that it could reach almost any target from any airbase even if it literally had to fly half way around the globe, which, unless the physics have changed, means part of that mission going or returning is going to be flown in daylight conditions. Where this is all well and fine, when the missions one flies are in Iraq and the Iraqis have no aircraft which can be stationed in Europe, North Africa, Asia or on aircraft carriers, thus they were incapable of engaging a B-2 moving at the speed of well short of the sound barrier, makes it a lumbering fat and impossible to miss target. Even training targets would pose a greater challenge. Granted, the B-2 had speed all over a blimp but in daylight conditions it may as well have been a blimp. 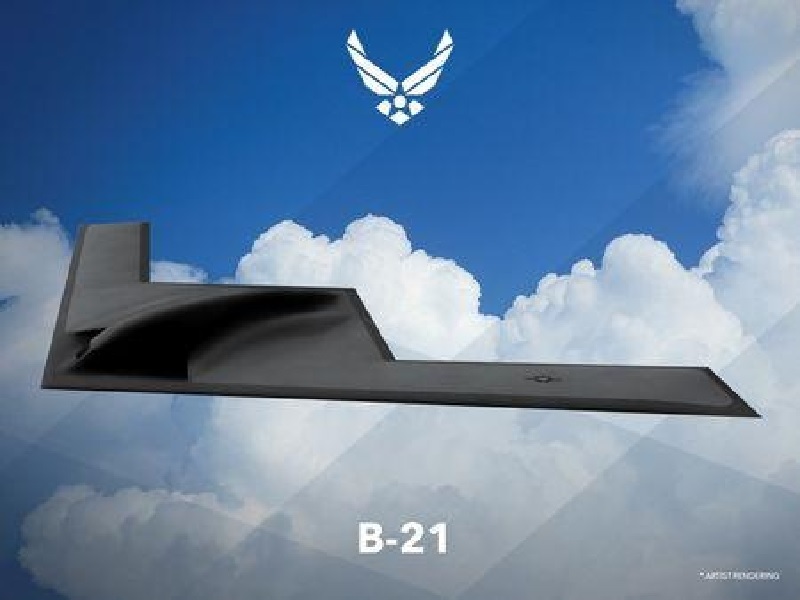 Hopefully they will have some really impressive thrust to weight ratios which will allow for some respectable speed with the B-21 and also have introduced new avionics and control circuitry and respective airfoils and wings making the B-21 at least marginally maneuverable. Perhaps the main reason for the B-21 is as a replacement initially for the B-2, it ended up being more of an experiment than an actual replacement for the B-52 fleet. This time they had better have gotten the mojo necessary to replace the high flying and initially invulnerable B-52 which still serves proudly well past what I like to call its air show and museum date. So, we will have to wait for more leaks which will tell us far more about the B-21 which, in all honesty, does appear to be a slightly tweaked B-2 stealth bomber. Without improved performance capabilities, they may as well as have put a new more stealthy advanced skin on a B-2 and saved development costs, but I am hoping for the American taxpayers that this bird can fly loops around both of its predecessors, the B-2 and the loud-n-proud old warrior which is older than its pilots, some of whose fathers also flew the B-52, a rarity in aviation. Even civilian aircraft do not have the lifespan of the average B-52 flown today. That will become one of the most respected and honored aircraft and will be a staple for museums, and if any get into private hands, impressive in a low and slow flyover at airshows; she will be missed.